Lismore, on the state’s Far North Coast was hit 9 October, by hail the size of tennis balls. It was the second day that severe thunderstorms and hail caused havoc in the northeast of the state. Windows and skylights at the local police station were smashed and an its vehicles suffered major damage, police reported. Several car crashes were also reported, along with a tree falling on a car and a skylight at the hospital smashing, exposing wards to rain, reported The Daily Telegraph, (10/10/2007), p. 13. 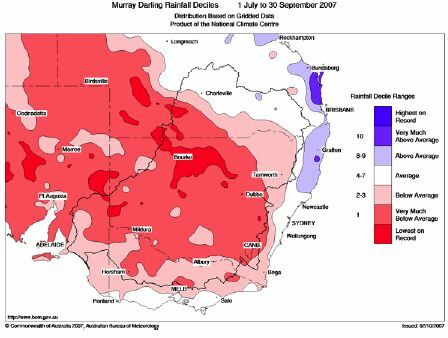 According to The Courier Mail, (08/09/2007, p.7) quoting SEQWater operations manager Rob Drury, a further month’s supplies were added to Brisbane’s dams through scattered rainfall over the past week with last Thursday’s inflows alone adding 5400 megalitres into the combined storages of Wivenhoe, Somerset and North Pine dams. Combined storage capacity at 20.56pc: A further 5000 megalitres was expected to flow into Somerset in the next two to three days from heavy rain in the far north of the catchment and the Sunshine Coast. The combined capacity of all three dams was 20.56 per cent on 7 September as showers continued in catchments. Somerset outshines: Somerset Dam had done best, with good rain at the Maleny end of the Sunshine Coast catchment. In the 24 hours to 9am on 7 September, the highest rainfall in Queensland was 129mm at Noosa Heads.